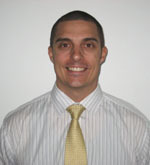 In April 2010 Chris Bain joined The DiFebo Company as General Manager of its Temple University property. 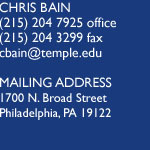 Bain currently oversees the sales and service of Season and Group Tickets for Temple Football and Basketball. Bain comes to The DiFebo Company after three years with Anschutz Entertainment Group (AEG) in Los Angeles, California where he managed the ticket sales department responsible for a variety of sporting events, family shows and awards shows at STAPLES Center, the Home Depot Center and NOKIA Theatre at L.A. Live. Prior to his arrival in Los Angeles, Bain worked with DiFebo at the University of Central Florida Athletic Association as an Account Executive where he played an integral role in the success of its season and group ticket sales and the opening of its on-campus football stadium. A native of Albany, New York, Bain received his undergraduate degree from the University at Albany and his Masters of Science in Sports Management at the University of New Haven. Bain and his wife, Jenna, reside in downtown Philadelphia. Chris started his career at the UCFAA where he was one of the leading Account Executives, contributing to unprecedented success in ticket sales for the UCF Knights. As a rising star in the ticket sales industry, Chris was hired by AEG as a Sales Manager.